When to Let Your Winners Run! 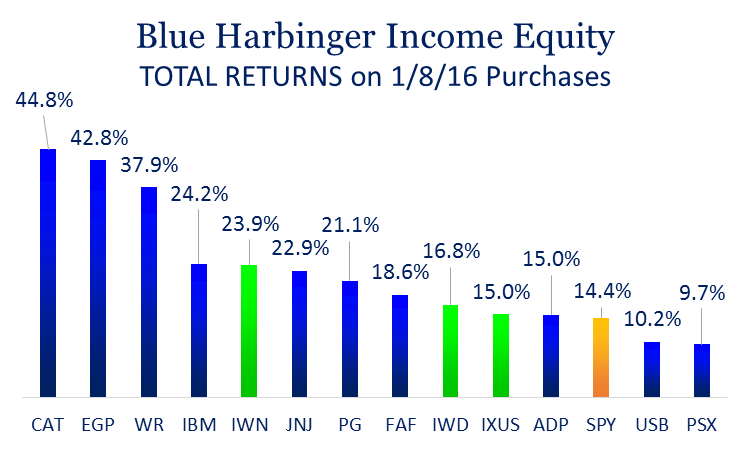 The following chart shows the returns on the 10 stocks and 3 ETFs we purchased in our Income Equity strategy on January 8th of this year (the names are reserved for members-only because we continue to own all of them, for the time being). 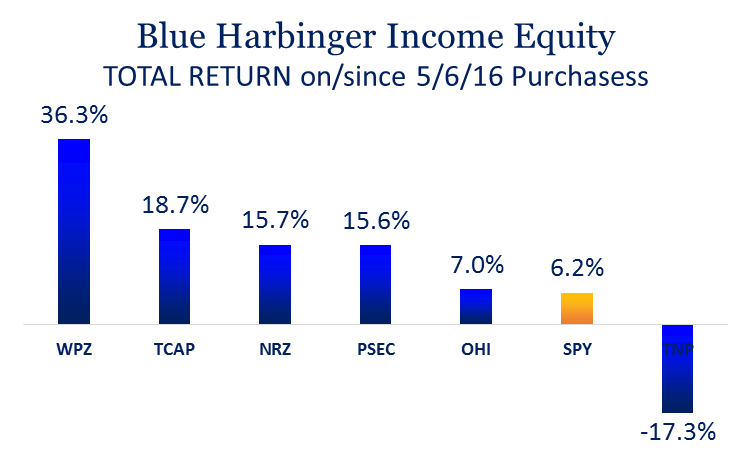 The only other trades we did in our Income Equity strategy this year were on May 6th when we purchased 6 additional stocks which have returned +36.3%, +18.7%, +15.7%, +15.6%, +7.0% and negative (17.3%) versus +6.2% for the benchmark S&P 500 since that date. This week’s Weekly provides our view on when to take profits versus when to let your winners run! Every company we buy, we intend to own forever. It doesn’t always work out that way (sometime we have to sell), but for the time-being we have no intention of selling. We bought all these names at discount prices. The companies are all very profitable, and we believe they are all remain relatively attractive (from a valuation standpoint) compared to the rest of the market. We intend to let our winners run! Everything we own in the Income Equity strategy is a value stock, and we believe value stocks will continue to outperform the market. Value stocks have a long-history of outperforming growth stocks over a long-period of time. However, due to the perverse market conditions created by the fed since the financial crisis (quantitative easing, low interest rates, etc.) growth stocks had been outperforming until recently. Value stocks have only recently started to outperform growth (as quantitative easing stopped increasing, and interest rates started to rise), and we believe this is a trend that will continue for years. We continue to like value stocks… a lot. Investing is somewhat counter-intuitive because many times you are far better off doing nothing (just keep holding the stocks you are holding). As soon as people start trading frequently is when they start making silly mistakes. Not only to they try to get “too clever,” but the trading costs add up fast and detract from long-term returns. We are avoiding the unnecessary trading costs. We are letting our winners run! The following table shows the weights of each position in our Income Equity strategy, and we feel no need to rebalance our holdings just yet. For example, no individual stock in this strategy is much over 5% (Caterpillar is our largest at 5.3%). The ETFs are closer to 11%, but they’re made up of hundreds of individual stocks, and they provide important diversification (at a very low cost). If any individual stock started to get close to 10% then we’d give serious consideration to rebalancing (whereby we’d sell down some of our biggest holdings, and buy more of our smallest holdings), but for the time being, we are letting our winners run! Putting money to work today? If you do have extra money that you’d like to invest right now, we recommend buying more of your worst performing stocks, because these are usually the best performing stocks going forward. There is a tendency for stock performance to “revert towards the mean,” and far too often we see people chasing winners instead of buying more of the losers (sounds counter-intuitive, but it’s smart to buy more of the underperformers if you believe they are great stocks which is likely the reason you bought them in the first place). FAF had been on a tear recently, up very significantly, until just this month as it was down more than 8% (it’s still up 18.6% since we bought it). On September 6th, First American Financial announced it would acquire RedVisioin (a provider of title and real estate property research). Companies often decline on news of an acquisition because markets believe it can be a signal of exhausted organinic growth forcing them to look outside to acquisition for less desireabe inorganic growth. However, in the case of First American Financial, acquisitions are a part of their business. FAF has the most comprehensive data in title search business, which is a significant competitive advantage that RedVision will benefit from. US Bank is a very high quality bank that continues to be inappropriately dragged down by negativity towards the banking industry. Investors are still angry about the 2007-2010 financial crisis, and recent news of scandal from Wells Fargo and insufficient capital for Deutsche Bank have only made the pessimism worse. However, US Bank has strong fee revenue (which insulate in from low interest rates), and it has a growing loan portfolio (and eventual rising interest rates will help the bank increase profitability further). US bank also flies under the radar a bit relative to the bigger banks (USB is regional), and this helps keep it out of the regulators crosshairs. Newer PostProspect Capital: Is it Still Safe?